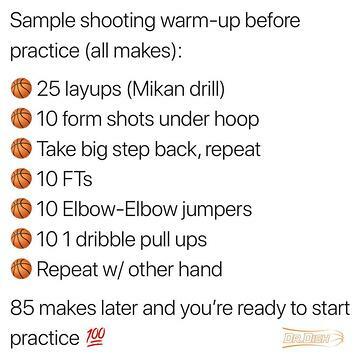 Do you have a routine to lock in your shot before practice or games? One of our biggest pet peeves is watching players step in the gym, grab a ball, and immediately start jacking 3 pointers and think that’s an acceptable warm up. Even the best shooters/players in the world start under the hoop and work their way out. Every rep needs to be purposeful, focused, and fundamentally sound. There’s no substitution for reps.
A few weeks ago we asked this same question in this Instagram post alongside our 85-make warm-up routine and the post was well loved, to say the least. We believe the reason it resonated with our audience so well was because most players desire to have a routine warm up plan, but often don't know where to start or fail to stick with it. We all need reminders! Whether you are a coach, player, trainer, or parent, create the standard that anytime work is about to be put in on the court - a consistent routine is completed first! It helps set the stage for a successful session in the gym. The key here is to find a routine that you feel covers the bases of the fundamentals. Follow it strictly for 3+ weeks, even referencing the list to make sure all steps are completed. After that, it will be memorized and the warm up will be a habit. Can you imagine what doing a simple routine like this every day would do for the mind, skills, and discipline level of a player? LOTS!